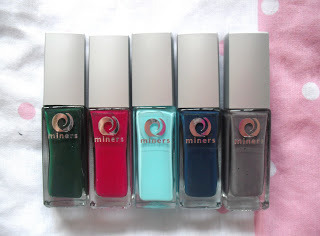 This is the second half of my Miners Cosmetics review. They sent me such a large parcel of products, so I decided to do it in two halfs. The majority of the package was lip products, so you can read the review for those here. This review is on everything else I was lucky enough to receive, eyeshadows, blusher, etc. 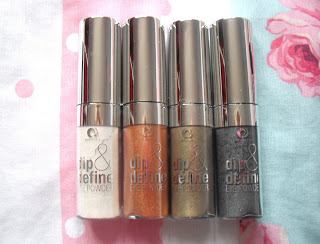 The first product is the Dip and Define eyeshadow (£3.49). Taking eye colour to a whole new level, the loose powder is enhanced with metallic flecks giving a pop of intense colour with shimmering undertones. They come in 6 colours, of which I received 3, Cloud 9, Cosmic Copper, Khaki Gold, and Rough Diamond. They all had a lovely little eyeshadow brush nip in the lid of the eyeshadow, and the poweder was very shimmery, but not very pigmented. 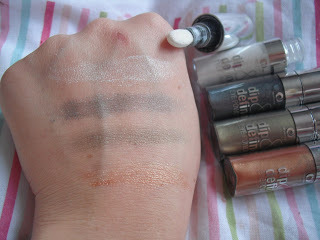 But its great to provide a bit of metallic glimmer to your eyelids. I also got 5 nail polishes from their nail range. 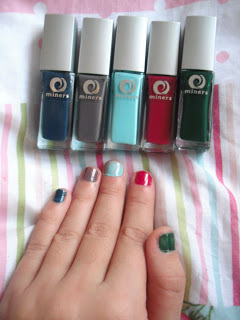 4 colours are deep, dark tones, but my favourite one is the mint nail polish from their pastel selection. I wasn’t hugely impressed with these as the forumla and consistency is a bit runny, but they have a large variety of colours to chose from, in some very unique shades, such as navy blue and grey. These cost only £2.99 each so I think they are value for money. 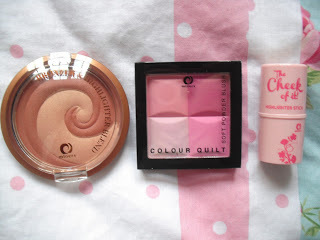 These are the 3 products I received from their Face range: Bronzer Blend, Colour Quilt, and Cheek of it! You can create a natural looking tan with Bronzer Blend (Sunkissed, £4.99), as the multi-tonal compacts each contain a glowing shade of brown partnered perfectly with a shimmering gold or rosy flush of pink. Designed to leave your skin with a gorgeous summer glow. I like that this isn’t all glittery, as I like using a matte bronzer. The Colour Quilt Blusher (Rosy Bloom, £4.99) contains four sections of blendable colour that will leave you with a gorgeous flush off colour, and a rosy glow. Your brush will pick up some of each shade resulting in the perfect blusher hue. The colours in this blusher palatte are gorgeous, they are the colour shades that I would usually use, I love the pink tones. Specially created to enhance your compexion, The Cheek Of It! highlighter stick (£3.99) is wrapped up in a handy twist up stick to ensure easy, mess-free application on the go and the compact size makes it perfect for popping into your handbag. It gives your skin a stunning, iridescent glow. The Define and Line easy glide Liquid Eyeliner has a long lasting, smudge proof formula and easy glide fibrous nib, ensuring eyes are defined and lined with professional results every time. The Voluptulash Volumising Mascara claims to give full-bodied lashes from root to tip. The unique hourglass shaped mascara brush is specially designed to sculpt and volumise, leaving you with voluptuous and luscious lashes. 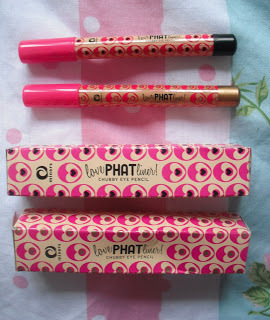 The last item I am reviewing is the Love Phat Liner (£3.99). 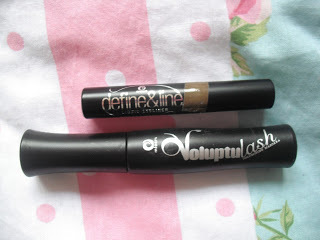 It is a versatile eye pencil that you can use as a liner, definer or all over eye colour. Love Phat Liner is the perfect pencil for recreating some the hottest trends. It comes in 6 colours, and I received a black and a gold one. The colour quilt blusher looks like it would be a really nice colour. Is the Cheek of it a good highlighter? I've been swithering over some of benefits highlighters for months but just can't seem to part with the cash.